It’s a bizarre mix between Black Mirror and those Emoji Robots from Doctor Who. 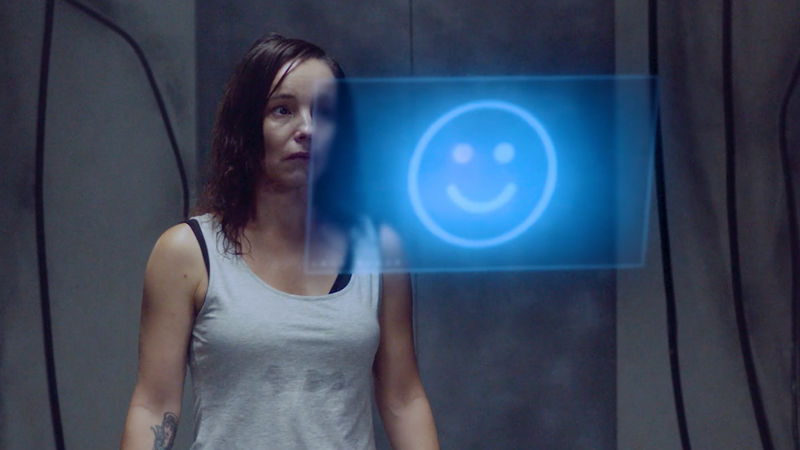 This new Swedish short film centers around a woman who, while locked inside a server room by a digital program, is forced to either endure illusions of her past... or take the easy way out. In the Gap, written and directed by Albin Glasell, stars Swedish actress Lo Kauppi as a woman who’s trapped inside a computer server room, with a countdown clock looming overhead. She’s being tormented by manifestations of her past mistakes, seemingly involving her daughter, and the Happy Face computer insists that she’ll feel better once she gives in and “uploads” herself to the server core. I won’t spoil what happens, but let’s just say there’s a twist in there that’s both fascinating and confusing. That’s kind of the short in a nutshell. It’s gorgeously shot, and Kauppi does a great job in the lead role—especially given how little dialogue she has. But I had to watch the film twice in order to get a semblance of what was going on, and I’ll admit I’m still confused. I definitely recommend checking it out, in any case. It looks great.